I continue my IMDB challenge with another Clint Eastwood film, the third I review after Unforgiven and Gran Torino. Having already watched other masterworks like Mystic River (4 out of 5) and Million Dollar Baby (4 out of 5) before I started the challenge, I will close my analysis of the great Clint with what is the highest-rated of all his films: The Good, The Bad and The Ugly in an upcoming post. Today though, it is time for his underrated Letters from Iwo Jima. There are two sides to every story. For Clint Eastwood “Iwo Jima” was a chance to tell the Japanese story during WWII. The film was to stand in direct contrast to his other motion-picture release in 2006: “Flag of Our Fathers” which elegantly portrayed the American side of the conflict. A great deal of credit should go to Mr. Eastwood for crafting a movie that delicately meanders through sensitive material that attempts to show us that war is as equally tragic and raw for both sides of a conflict. It is a testament to Eastwood’s sensibility that such a movie got the go-ahead from a Hollywood establishment that knew, as do we, that if a movie that is sensitive to the Japanese during the war was ever to be made, there could have hardly found anyone better that the detailed-oriented and mild-mannered Clint Eastwood to direct it. Having said that, no one could expect “Letters from Iwo Jima” to be a factual representation of the events that transpired on the island. In fact, most of the artistic licenses taken probably made the film more effective as it help show that it was not a movie about the specifics of the war, but about the tragic human conflict that transpired on the ground. Once again, Eastwood makes a film that is elegantly embedded with layers of meaning that try to tackle the complexities of the human spirit in the midst of extraordinary circumstances. Eastwood does not take sides. His statement is to simply show that war is a calamity no matter what side you are on and that most of the soldiers are simply victims of higher powers. There are aspects within “Iwo Jima” that are rather commonplace in a film touching upon WWII. There are the cowards, the fanatics of war, the patriots, the courageous leaders of men and, of course, the followers. In fact, the film suffers a bit when it relies on these typologies a bit too much. However, Iwo Jima has a dramatic power that comes from its realist feel of the struggle. Some of the merit for the effectiveness of this film should go to the casting director who assembled a very talented group of Japanese actors led by Ken Watanabe as General Kuribayashi. The manner of the direction immerses us as one of the soldiers. The proximity to the men in the caves and their struggle to survive speaks about a film that is more interested in exploring the battered spirit of the Japanese soldiers, many of whom knew they had come to the island to die, leaving their families and lives behind, away from the mainland. In this context, the harshness and austere quality of the terrain where the movie was shot helps to bring out the sense of solitude and helplessness that the Japanese soldier must have felt while patiently waiting inside make-shift caves, as the grand fleet of American forces was deployed on the shores. Overall, Iwo Jima deserves some praise, but when compared to other war-time films like Saving Private Ryan or Schindler List, Iwo Jima appears to be a bit too modest and a bit too careful to equal some of the modern masterpieces that tried to capture the tragedy of WWII. Hi Niels, I agree that this film is underrated too. 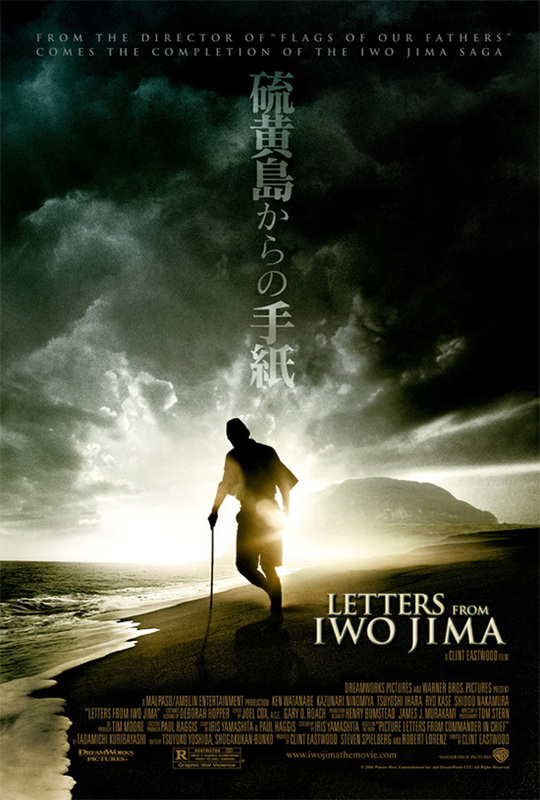 I really enjoyed Letters from Iwo Jima and found it infinately superior to Flags of Our Fathers (a film which I found really disappointing). What is your view on Flags of Our Fathers? I haven’t seen Flag of our Fathers in a while but I do remember being a bit disappointed too. By the way, have you watched “Unforgiven” because I also made a post a couple of weeks ago about it and so far it’s the only film from the TOP 250 challenge that I’ve given 5 out of 5.